In addition to their awesome bulk section and farmer’s market caliber produce, one of the reasons I prefer shopping at our local mega-co-op, Rainbow Grocery, is the tough love. Unlike at Whole Foods, where the friendly, helpful employees always creep me out a little, the workers at Rainbow seem to take pleasure in customer disappointment. And yet, masochistically, I don’t mind the bitchy workers. It’s the annoying Rainbow customers that drive me crazy. When I shrugged, the man bustled over to the produce stocker and asked to be advised as to the best peaches. “See,” the man called to me, “I just saved you, like, twenty bucks!” I reluctantly replaced the peaches and reached for a bag of cherries instead. The stocker smirked. “That’s because the season’s already over. Gone. You missed ’em.” Satisfied by the customer’s crestfallen expression, he turned back to stocking plums. Perhaps if I were a produce stocker at Rainbow I’d be too proud to buy Washington cherries in July. Luckily, I’m not. I brought them home and made these tarts inspired by one of my favorite blogs, Vegetarian Ventures. Shelly fills hers with tiny strawberries topped with basil microgreens. 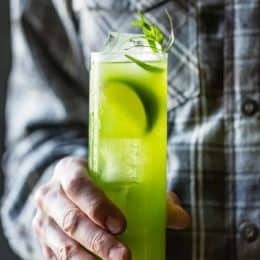 (Basil mircogreens! Genius!) 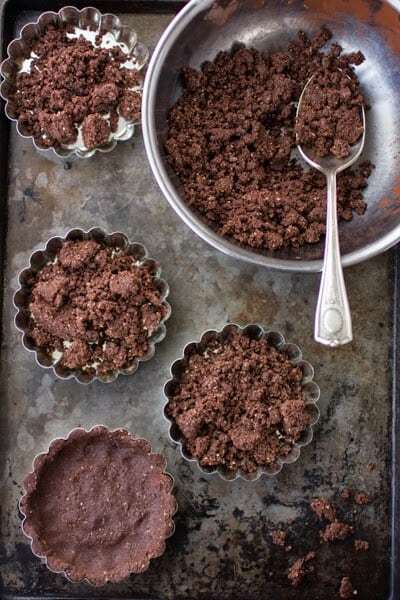 Her Mini Strawberry Chocolate Tarts with Whipped Goat Cheese are not only beautiful, but also healthy – grain-free and maple-sweetened, with yogurt in the filling. I made my tarts a bit more traditional with a buttery crust, creamy center, and just enough sugar in each component to make these tarts sophisticatedly (that’s totally a word) sweet. I can’t decide what I like best about these tarts. There’s the gluten-free press-in crust that, thanks to dutch-processed cocoa powder, tastes like almond-flecked oreos. There’s the cloud of whipped goat cheese filling that smacks of cheesecake. 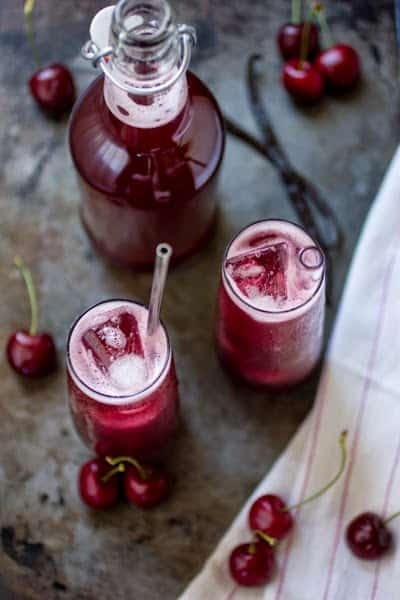 There are plump cherries simmered with ruby port and vanilla bean that manage to taste even more like themselves than plain cherries. And then! There’s the leftover syrup from the cherries that, when mixed with ice and fizzy water, makes the deepest, darkest, most delicious cherry cream soda, ever (rye whiskey optional). 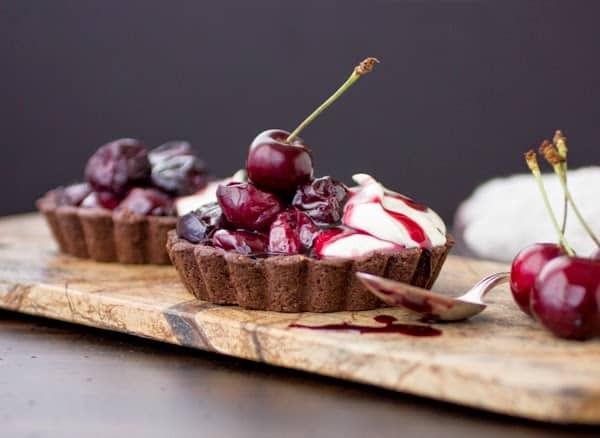 The cherries alone are very worth making, and will probably keep, refrigerated in their syrup, for up to a month or two, or frozen for much longer. and thwart snarky produce stockers. 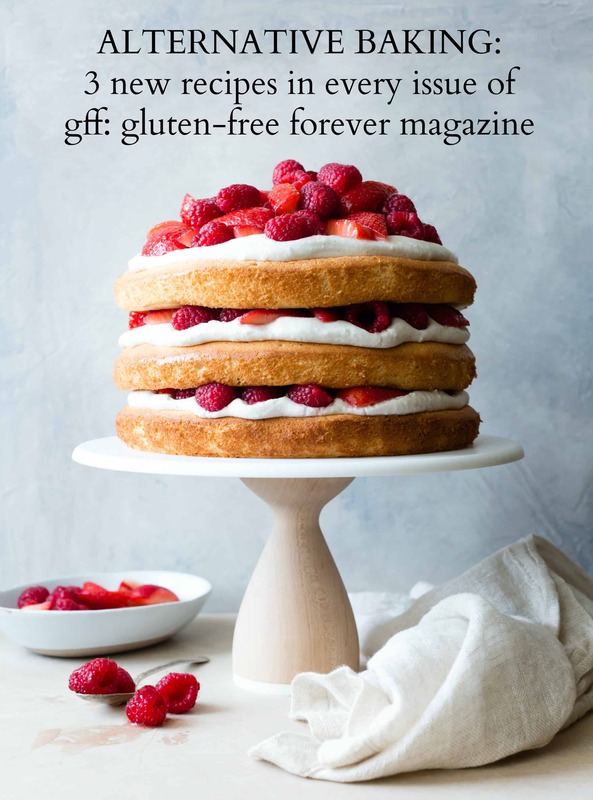 If gluten is an issue for you or your guests, be sure to seek out certified gluten-free ingredients (particularly oat flour). If gluten isn’t an issue, feel free to use this recipe instead. I like the Oreo-like flavor of dutch-processed cocoa powder in the crust, but natural cocoa should work, too; the crusts will be lighter in color, and have a slightly different (though still delicious) flavor. I used an organic California zinfandel port from Sobon that was mildly sweet, and I think it contributed to the deliciousness of the cherries. Cherry pitting can be messy business, so I recommend wearing all black to do the deed, and latex gloves if you mind having purple-hued fingers the next day. If you lack individual tart pans, this recipe should work in an 8- or 9-inch tart pan. These should be assembled “a la minute,” or to order, lest the shells become soggy, but you can make all the components up to two or three days ahead. 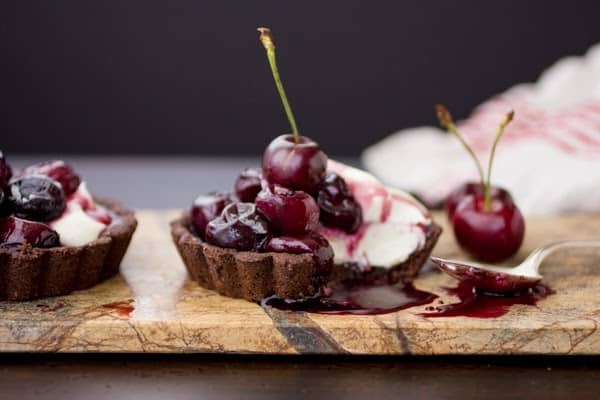 If you prefer to assemble the tarts in advance, you can paint the inside of the crusts with melted chocolate (shown here) to protect them from the moisture of the filling. 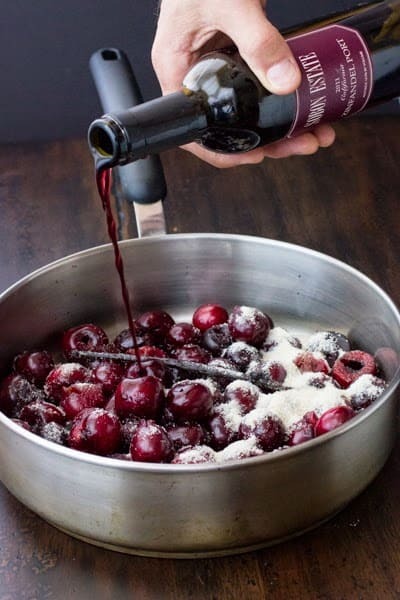 In a wide, stainless steel skillet, combine the pitted cherries, port, vanilla pod and scrapings, and sugar. 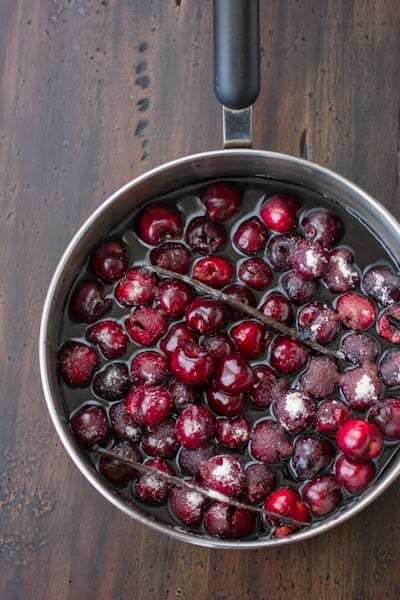 Bring to a simmer over medium heat, then reduce the heat to low and simmer, shuffling the pan occasionally, until the cherries are firm-tender, about 10 minutes. Position a rack in the center of the oven and preheat to 350ºF. 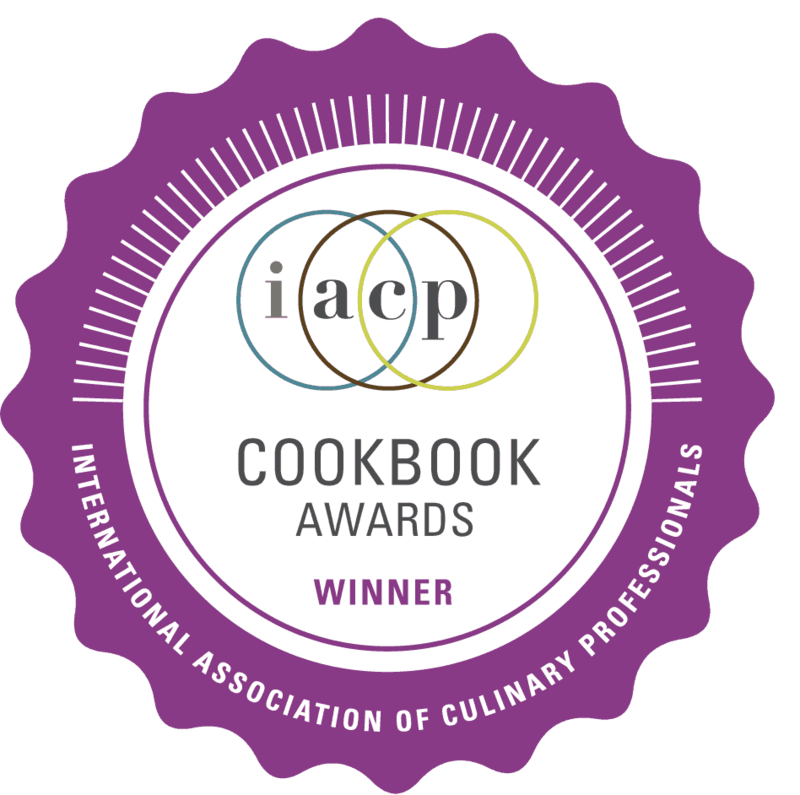 Place six 3 1/2″ tart pans with removable bottoms (or one 8 or 9″ pan) on a baking sheet. 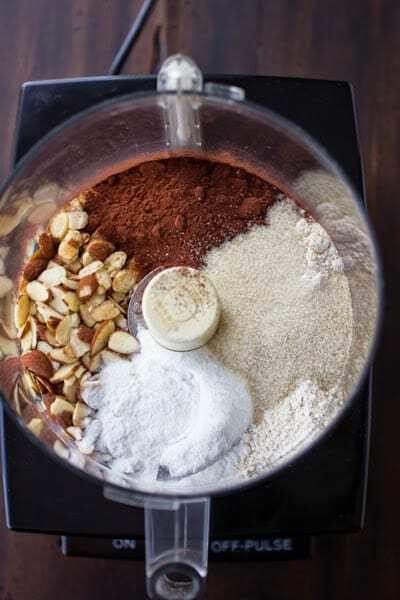 In the bowl of a food processor, blend the sliced almonds, flours, cocoa powder, sugar, and salt until the almonds are pulverized, about a minute. Scatter the butter pieces over the top, sprinkle over the vanilla extract, and process until the mixture forms large, moist clumps. Divide the crust crumbs evenly among the tart pans. Press first the sides, then the bottoms, into the pan, taking the time to make the crust even and square where the sides meet the bottom. (If the dough is soft or sticky, chill it for 5-10 minutes until it will behave.) Freeze the shells until firm, at least 15 minutes (or wrap and freeze for up to several months). Bake the shells until they are dry and fairly firm to the touch, 15-20 minutes. Let the shells cool completely. Store them in their rings for protection until ready to serve. In a large bowl, combine the crumbled goat cheese, cream, vanilla seeds, and sugar. Whip with a sturdy wire whisk until soft peaks form. 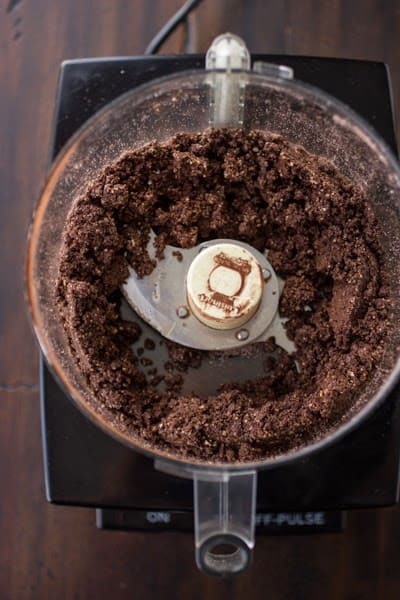 (Tip: if you overwhip and the mixture becomes grainy, gently fold in a tablespoon or two of heavy cream until the mixture smooths out again.) Chill if not using right away. 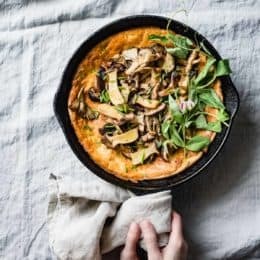 Just before serving, carefully remove the shells from the pans by placing a tart pan on a small, inverted bowl and gently easing away the sides. Use the tip of a sharp knife to gently pry the tart shell away from the bottom of the pan. Place the tart shells on their serving plates. Divide the cream among the shells. 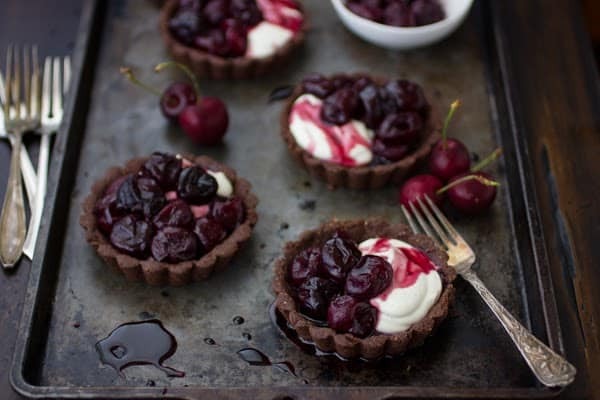 Spoon the cherries over the cream, drizzling with their syrup. Serve right away. Call me crazy but I actually like when the cherries have that sour taste. 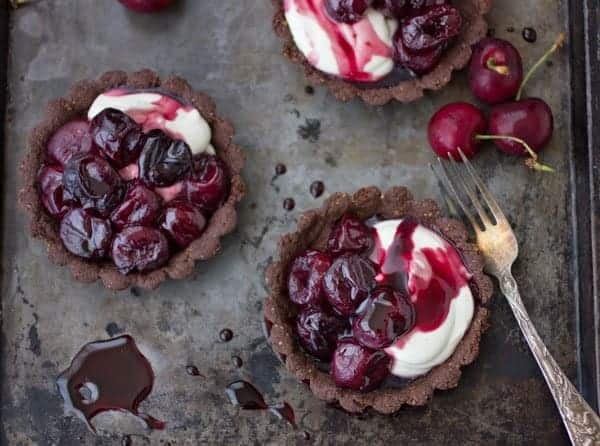 These tarts look heavenly! Oh yum! 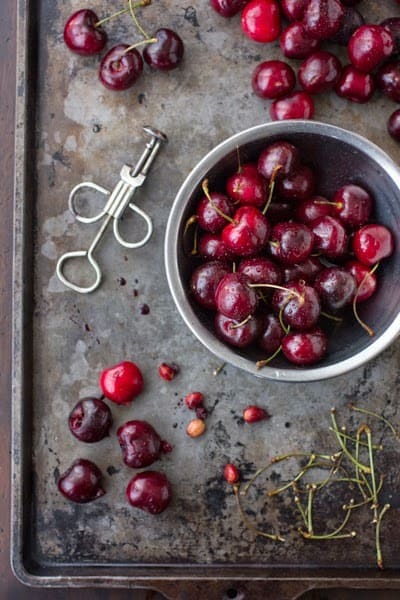 You now have me craving cherries :-) Beautiful recipe. Wow…these are gorgeous! I love that "cher of bowlies" photo and the luminous cherry fizz with the glass straw. 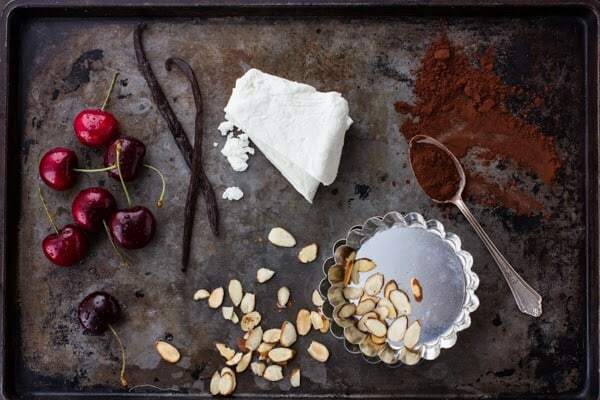 What could go wrong with chocolate, cherries and cheese??? And port, vanilla, almonds…oh, yum! These are SO gorgeous!! I love the deep red with the chocolate crust – too perfect. Thanks so much for the inspiration, Shelly! I love these tarts. this looks great. 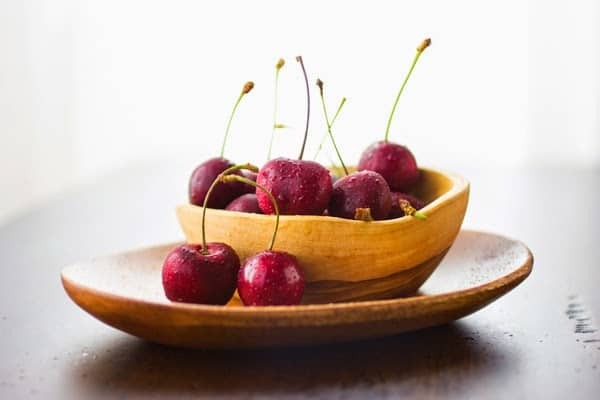 i'm a sour/pie cherry person myself – how do you think they would work in here? I'm thinking those cherries and sauce would be great of a bit of frozen yogurt. oh and then bake just the crust and crumble some up to sprinkle over the top. yes? Thanks! 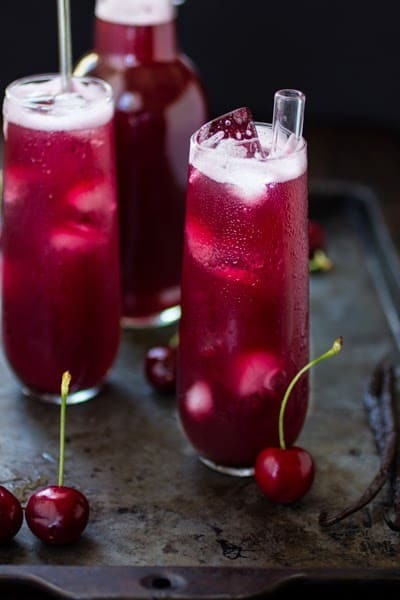 I think sour/pie cherries could be great here; my only concern is that the port might overwhelm their flavor, and you would probably want to increase the sugar. 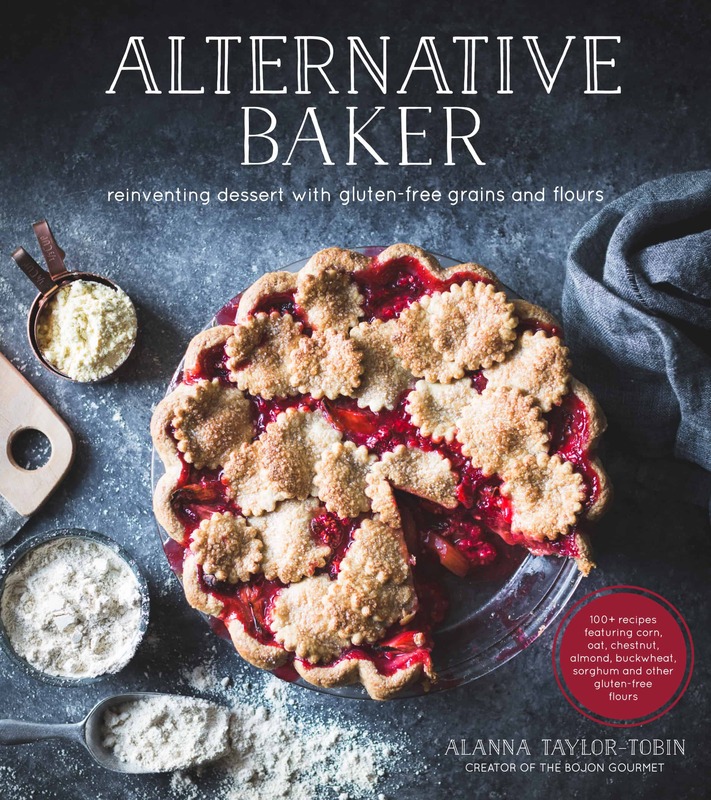 Love the idea of serving them over frozen yogurt, and using the crust as a crumble. You can probably just spread the unbaked, crumbly dough on a baking sheet, and bake it until it's done. Let me know how it goes! Omg, how gorgeous are these?? (And goat cheese whipped cream! Whoa.) Over shmover, I am all for keeping the cherry season alive. (I totally bought some yesterday.) 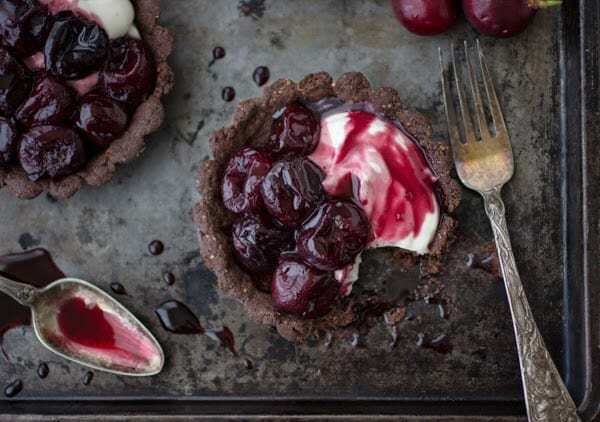 I fell in love with those tarts of Shelly's, and I adore this take on it. 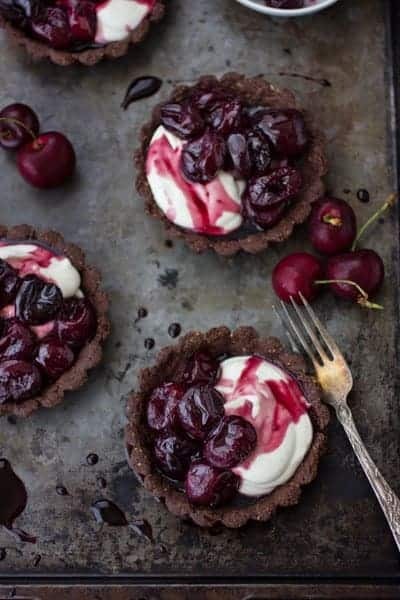 I can imagine how good the syrupy cherries are against the goat cheese whipped cream all piled up on that chocolatey shell. YUM. And ha! I am totally drawn to those "tough love" employees too. It kind of reminds me of this article I read on the psychology of waiting tables years ago. It basically said that the servers who were overly friendly and made the customers feel like s/he was there to do everything in his/her power to make them happy made less in tips than the servers who were aloof and didn't bother with jokes or small talk, and essentially sort of made the customers feel like they needed to work to gain the server's respect. Mind games! Crazy stuff. 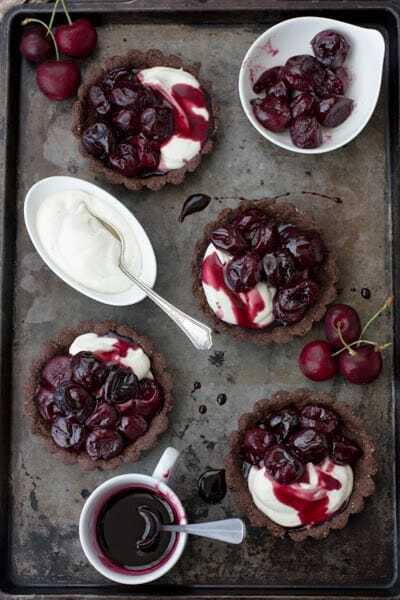 This looks amazing- wondering what your thoughts are on using frozen cherries- gasp! 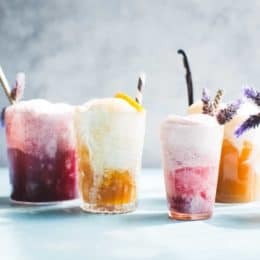 I just think I am possibly too far past season to get fresh now… and I really want to make them for a party this weekend!